When sharing the secrets of electronic medical record (EMR) usability, some people are surprised at how much culture and terminology impacts user satisfaction. Allow me to explain. Socks go in the sock drawer. T-shirts go in the t-shirt drawer. 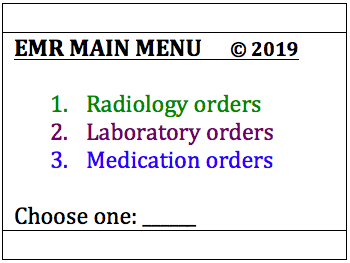 ... and when you click on the button "RADIOLOGY ORDERS", one would expect to find the orders related to diagnostic and therapeutic/procedural radiology modalities. How many items do you need to store in a chart, for patient care purposes? In which 'drawers' will you store them? We don't consciously think about categorization schemes very much, but our brains do this naturally, to try to make sense of the world, and establish a pattern that will ultimately help us get dressed in the morning. Anyone who's ever had to share a closet, however, knows there can be disagreements about categorization schemes, resulting in some interesting household debates. If you have children, you also know it's helpful to label drawers, or explain the categorization scheme, so your kids can find their clothes in the right drawers. Food pantries and refrigerators are common sources of domestic debates, because different family members might have different ideas about ideal organizational schemes. So it's no surprise that people who are responsible for configuring and organizing an EMR often stumble upon the many cultural differences in thinking and terminology between "healthcare tribes" - E.g. between physicians, nurses, pharmacists, radiologists, laboratorians, ancillary services, medical records, finance, etc. Imagine it's the year 2050. You run a hospital with an EMR. It is suddenly discovered that tomatoes save lives, so you prepare to have tomatoes in your hospital, keeping them in your Pyxis machine, and create tomato orders in your EMR, to order and release the tomatoes for patient care (when needed). Shortly after building this, you suddenly get complaints from Tribe B users, who couldn't show up to the earlier meeting but say, "Hey wait, tomatoes are technically berries, which are technically fruit - Here is the evidence : https://en.wikipedia.org/wiki/Tomato - So they should be listed under the "Fruit" menu choice instead! Those of us who know this can never find the Tomato order!" You also get complaints from Tribe C users, who say, "What's a Tomato? We've never heard of that. Oh, wait, you mean that red thing we put in our salads/sauces/sandwiches? We've been doing this for 20 years, and in our experience, we've always called it a Golden Cherry." OPTION 1. Listen to Tribe A, and file the tomato order under the "vegetable" menu, and educate Tribes B and C that tomatoes are red fruit that grow on a vine, are commonly used to make sauces/salads/sandwich toppings, and most commonly thought of as vegetables? OPTION 2. Listen to Tribe B, file the tomato order under the "fruit" menu, and educate Tribes A and C that tomatoes are red fruit that grow on a vine, are commonly used to make sauces/salads/sandwich toppings, and correctly categorized as fruit? OPTION 3. Listen to Tribes A and C, rename the tomato order to a golden cherry order, file it under "vegetable", and educate Tribe A that tomatoes will now be referred to as a golden cherry and will be filed under the vegetable menu? OPTION 4. Listen to Tribes B and C, rename the tomato order to a golden cherry order, file it under "fruit", and educate Tribe B that tomatoes will now be referred to as a golden cherry, and will be filed under the fruit menu? Tomato ('golden cherry') - A common red fruit/vegetable that grows on a vine in temperate climates, that is commonly used to make salads, sauces, and sandwich toppings. 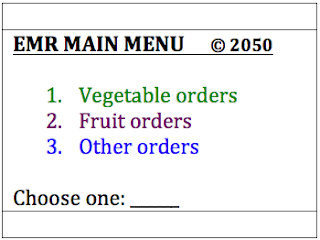 Or build a hybrid "vegetable/fruit" menu choice? ... or more options we haven't considered yet? How these terminology, taxonomy, and conceptual issue get managed will ultimately impact the satisfaction of users who are trying to find a tomato ('golden cherry') in the EMR for patient care. Remember this blog is for education and sharing purposes only. Have other examples of terminology and classification systems impacting EMR usability and satisfaction? Or have you struggled with this yourself? Feel free to share in the comments section below! So I'm working on a blog post about physician leadership and healthcare traditions, but before I can write that blog post, I had to research some about our history in healthcare - When major things happened, how we got here, and how those discoveries years ago helped to shape our modern healthcare landscape today. Initially, I thought I'd go back 100 years, to see what the major achievements were - and how they impact us in today. And then I found out - there were several achievements way before that, that I needed to include, because they are still shaping modern healthcare. The healthcare environment we think of today is largely the result of many decisions, discoveries, and role developments, some serendipitous, that occurred slowly over the last 250 years. So I thought I'd document some of the major highlights here, for review and discussion, before I plan my next blog post. Feel free to review and enjoy - And if you see items that need to be added, please leave them in the comments section below! 1765 - First US Medical School opens, the College of Philadelphia (now the University of Pennsylvania). Ben Franklin recommends documenting care, and creates first medical record. 1800s -1900s - While German and British healthcare models grow in Europe, most American ‘healthcare’ exists largely as a mix of voluntary, religious, and charitable alms houses, along with some battlefield doctors and nurses tending to the wounded. 1846 - Hungarian doctor Ignaz Semmelweis recommends hand washing to help prevent the spread of disease. 1846 - Dentist William T. Morton and Surgeon John Collins Warren do first surgical procedure with anesthesia at Mass General Hospital. 1854 - Florence Nightingale documents first Quality Improvement project during Crimean war, reducing mortality rate in Crimean War from 42% to 2% - Registered Nursing soon becomes a profession, with formal hospital-based training programs. 1854 - Cholera outbreak occurs in London, and John Snow investigates and practically invents Public Health. 1862 – Louis Pasteur develops pasteurization. 1879 – French physician Charles Chamberland develops sterilization technology. 1881 – Louis Pasteur develops anthrax vaccine. 1883 - German Chancellor Otto Von Bismark develops first state-run medical insurance program. 1885 – Louis Pasteur develops rabies vaccine. 1895 - William Conrad Roentgen accidentally discovers X-rays, wins Nobel in 1901. 1910 - Flexner Report formalizes and standardizes medical education to 4-years plus residency. 1916 - After isolating it from canine liver cells, heparin discovered by surgeon Jay McLean and physiologist William Henry Howell, but not available for clinical trials until 1935. 1918 - Influenza Pandemic kills millions worldwide. Surgeon General Dr. Rupert Blue uses public health tools and documentation to save lives. 1920s – 1980s - A predominantly employer-based fee-for-service health insurance system develops in the US, in a very fragmented, decentralized manner - with private insurers and the government eventually filling some, but not all of the gaps. 1928 - Sir Alexander Fleming accidentally finds an empty circle around some mold on a staphylococcus culture plate, and discovers the "wonder drug" penicillin. 1928 - First MCAT Test. 1930 – President Hoover creates Veterans Administration and first VA Hospitals. 1935 - Heparin first available for clinical trials. 1942 - William Beveridge publishes "Beveridge Report" which advocates for England to build a "National Health System"
1942 - After noting that WWI mustard gas was a potent suppressor of hematopoeisis, nitrogen mustards were further developed during WWII at Yale University and were given by vein (instead of inhaling irritant gas) to several patients with advanced lymphomas who had temporary but notable improvements, in what was the first chemotherapy regimen. 1945 - Industrialist Henry Kaiser builds first pre-paid health program for his employees which becomes "Kaiser Permanente"
1945 – 1950 – Penicillin becomes more widely available. Narcotic analgesia also becomes available. 1950s – Jonas Salk develops polio vaccine. Nursing training programs begin to move from hospitals to colleges and universities. 1950s - Physicist Gordon Brownell and neurosurgeon William Sweet from Mass General use first PET scanner to detect brain tumors using sodium iodide. 1951 – Joint Commission establishes itself as “The Joint Commission of Accreditation of Hospitals”, but accreditation has no significant impact until 1965 (see below). 1951 - American College of Obstetricians and Gynecologists (ACOG) formed, formalizing specialty training for obstetric care and Women's Health. 1952 - American Psychiatric Association publishes first Diagnostic and Statistical Manual (DSM) of Mental Disorders, standardizing and formalizing diagnostic criteria for patients with mental health needs. 1953 - Although they did not 'discover DNA', James D. Watson and Francis Crick build upon X-ray crystallography work by Rosalind Franklin and Maurice Wilkins to publish description of double-helix structure of DNA. 1955 - Chemist Leo Sternbach invents benzodiazepines when he accidentally discovers chlordiazepoxide (Librium), first available for clinical use in 1960. 1956 – 1958 - Dr. Peter Safar develops A-B-C technique for CPR, convinces Baltimore Fire Department to have first ambulance staffed with Emergency Medical Technicians, and creates first 24-hour ICU. 1960 - First oral contraceptive pill, Enovid, is approved by FDA. 1964 - First loop diuretics ethacrynic acid and furosemide approved for use. 1965 – Centers for Medicare and Medicaid Services (CMS) established, and establishes Joint Commission accreditation as a Condition of Participation (CoP). 1967 - South African surgeon Christiaan Barnard does first heart transplant. 1968 - First 911 call made in Haleyville, Alabama to the Fire Chief, starts first US 911 service. 1968 - NEJM publishes 'Medical Records that Guide and Teach' by Larry Weed, MD, creating the first SOAP note allowing easier transfer of patients between providers. 1971 - First CT scan used to image a living brain. 1970s - 1980s – Most US patients continue to receive care in Fee-for-Service. 911 service continues to expand. 1973 – Rising healthcare costs spur President Nixon to sign Health Maintenance Organization (HMO) Act, opening way for development of for-profit hospitals and private HMOs. 1975 - First whole-body CT scanner was built. 1977 - American physician Dr. Raymond Damadian does first MRI to diagnose cancer. 1979 – American Board of Medical Specialties votes to create American College of Emergency Physicians, formalizing the training and role of Emergency Medicine physicians. Many hospitals go from having daytime ‘Accident Rooms’ to formal, 24/7 ‘Emergency Departments’. 1980s - AIDS epidemic discovered to be caused by HIV virus, nationally changing infection control procedures and safety standards for blood supply. 1980s - 1990s – HMOs and Payment Reform start to significantly change the billing landscape and increase demands on physician documentation. 1996 – Health Insurance Portability and Accountability Act (HIPAA) first signed into law (with updates in 2004, 2005, 2009, and 2013). NEJM Publishes first article describing new specialty of Hospitalist Medicine. 1999 – Institute Of Medicine (IOM) releases report To Err Is Human : Building a Safer Healthcare System. 2000 - 93% of the US Population has access to 911 service, and WHO ranks Britain 18th, Germany 25th, and America 37th best in the world. 2008 – Global financial crisis leads to US American Reinvestment and Recovery Act (ARRA), including HITECH Act with $19.3 Billion for Meaningful Use. EMRs become ubiquitous across healthcare landscape. 2017 – More female candidates than male candidates enroll in American medical schools. Remember : This list is not comprehensive - Have anything you'd like to add to this list? Leave comments in the comments section below! Remember, this blog is for only for educational/discussion purposes only! This month, I thought I'd help demystify a common Computerized Provider Order Entry (CPOE) issue, that actually has a big impact on clinical workflows - Order modes. When is it appropriate to use telephone orders? When is it appropriate to use verbal orders? When is it appropriate to use written orders? When is it appropriate to use protocol orders? ... then you've shared in the very common struggle with CPOE order modes. Order modes don't need to be confusing. 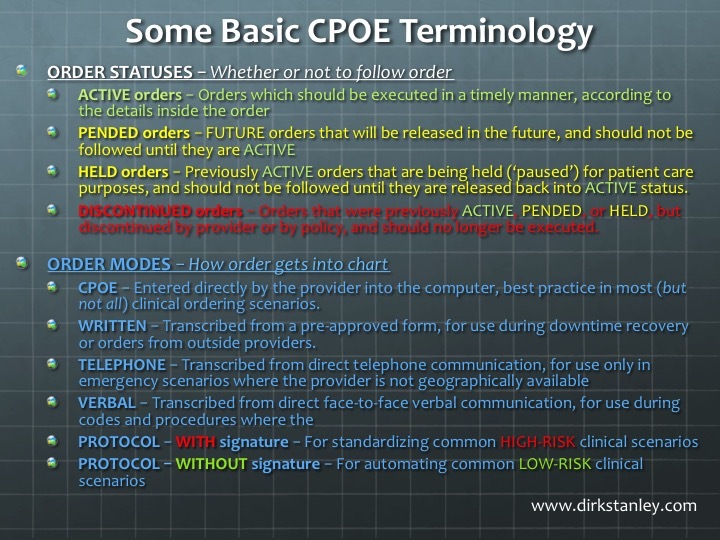 One of the most common sources of confusion stems from the use of the term 'Computerized Provider Order Entry', or 'CPOE'. 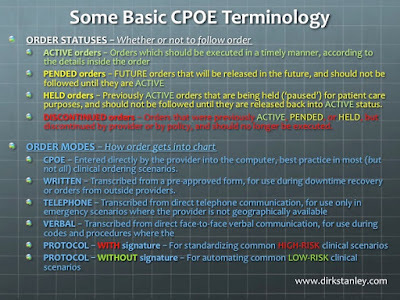 On selecting an EMR, some organizations assume that having a 'CPOE system' implies that all orders will be entered directly by a provider (The POE in 'CPOE') - And that once it is up-and-running, that there will no longer be any reasons for anyone else to enter orders. Some of those organizations may recognize the need to maintain telephone and verbal orders, for emergency purposes, but don't appreciate the same need for written or protocol orders. The truth is that while providers entering their own orders is a best practice, ideal and applicable in almost all ordering scenarios - It is not useful, or even possible, in all scenarios. For this reason, out of necessity, most EMRs recognize a few different ways that orders get entered into the EMR. I'm hoping this post will help generate more clarity around their use, and how they can help you streamline, and even improve, your clinical workflows. To better understand order modes and how they help streamline and support workflows, it's first helpful to understand the difference between an order mode, and order status. It's again important to note that direct provider order entry ('CPOE') may be a best practice in almost all clinical scenarios - But the other order modes exist to support order entry in scenarios where it is impossible or even undesirable for the provider to enter the order directly. So to make sure you're only using those other order modes for the right scenarios, you'll want organizational policies in place to make sure they are being used appropriately and safely. The following policy discussion sheds more light on these scenarios, and at the end I've provided a nice summary table. ACTIVE orders - Orders which HAVE been submitted and signed by a licensed prescriber, or by a well-trained, delegated clinical team member on behalf of a licensed prescriber as part of a standardized, clear, well-developed protocol approved by legal, nursing, provider, and pharmacy leadership. These orders are ACTIVE and should be executed in a timely manner, according to the details contained inside the order. Outcomes from all active orders are attributed to the licensed prescriber. PENDED orders - Future orders which HAVE been submitted and signed by a licensed prescriber, in anticipation of planned future release ('activation') at a future date/time by the licensed prescriber, or by a well-trained, delegated clinical team member on behalf of the licensed prescriber as part of a clear, standardized, well-developed protocol approved by nursing, provider, and pharmacy leadership. These PENDED orders are NOT ACTIVE and SHOULD NOT be executed until they are released ('activated') into ACTIVE order status by a licensed prescriber, or by a well-trained, delegated clinical team member on behalf of a licensed prescriber as part of a standardized, clear, well-developed protocol approved by legal, nursing, provider, and pharmacy leadership. Outcomes from all pended orders are attributed to the licensed prescriber. HELD orders - Previously ACTIVE orders which have been placed on hold ('paused') by a licensed prescriber, or by a well-trained, delegated clinical team member on behalf of a licensed prescriber as part of a standardized, clear, well-developed protocol approved by legal nursing, provider, and pharmacy leadership. These HELD orders are NOT ACTIVE and SHOULD NOT be executed until they are again released back into ACTIVE order status by the licensed prescriber, or by a trained, delegated clinical team member on behalf of the licensed prescriber as part of a standardized, well-developed protocol approved by legal, nursing, provider, and pharmacy leadership. Outcomes from all held orders are attributed to the licensed prescriber. DISCONTINUED orders - Previously ACTIVE, PENDED, or HELD orders which have been discontinued ('deactivated') by a licensed prescriber, or on behalf of the licensed prescriber by a well-trained, delegated clinical team member as part of a clear standardized, well-developed protocol approved by legal, nursing, provider, and pharmacy leadership. These discontinued orders must be retained as part of the legal medical record but must NO LONGER be executed for patient care purposes. Outcomes from all discontinued orders are attributed to the licensed prescriber. 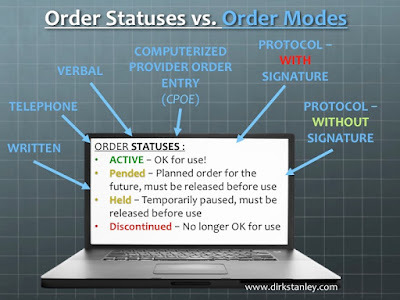 CPOE ('PROVIDER') order MODE - Routine orders originated, entered directly, reviewed, and immediately signed (authenticated) by a licensed prescriber, allowing the prescriber to follow decision support rules and order designs that guide best practices and identify errors before they occur. TELEPHONE order MODE - Orders originated by a licensed prescriber via direct telephone ('voice-to-voice') communication, and transcribed by a Registered Nurse, Registered Pharmacist, or other registered, licensed, and trained, delegated team member on behalf of the originating licensed prescriber according to a well-developed plan approved by legal, nursing, pharmacy, and provider leadership. Telephone orders must be signed by the originating licensed prescriber within _?12_?24_ hours. VERBAL order MODE - Orders originated by a licensed prescriber via direct verbal ('face-to-face') communication, transcribed by a Registered Nurse, Registered Pharmacist, or other registered, licensed, and trained, delegated team member, on behalf of the licensed prescriber, according to a well-developed plan approved by legal, nursing, pharmacy, and provider leadership. Verbal orders must be signed by the originating licensed prescriber within _?1_?2_?6_ hours. WRITTEN order MODE - Orders originated by a licensed prescriber via a pre-approved paper form (approved by legal, nursing, pharmacy, and provider leadership), and transcribed by a Registered Nurse, Registered Pharmacist, or other registered, licensed, and trained, delegated team member (according to a well-developed plan approved by legal, nursing, pharmacy, and provider leadership). Since these paper orders must be signed prior to transcription, they [ usually ] do not require re-authentication ('re-signing') after transcription. The original paper orders are part of the legal medical record and should be retained for quality-control purposes. PROTOCOL - WithOUT SIGNATURE order MODE - LOW-risk patient care orders which are activated, modified, or discontinued by a Registered Nurse, Registered Pharmacist, or other registered, licensed, and trained, delegated team member, on behalf of an attending prescriber, as part of a standardized, clear, well-developed protocol approved by legal, nursing, pharmacy, and provider leadership. By policy, all child orders from these low-risk patient care protocols are attributed to the attending provider, and do not require signature. PROTOCOL - WITH SIGNATURE order MODE - HIGH-risk patient care orders which are activated, modified, or discontinued by a Registered Nurse, Registered Pharmacist, or other registered, licensed, and trained, delegated team member, on behalf of an ordering prescriber, as part of a standardized, clear, well-developed protocol approved by legal, nursing, pharmacy, and provider leadership. By policy, all child orders from these high-risk patient care protocols are attributed to the ordering provider, and require signature within __?12_?24__ hours. These are all just [ DRAFT ] definitions - You'll want to check with your own legal team before you consider them and approve them for use in your own organization. There are several signature timeframes which are unidentified (E.g. "__?__ hours") - You will want to review them with your own risk, legal, nursing, provider, and pharmacy leadership to decide on an organizational standard for these. Since these orders all carry risks of miscommunication, you will want to set these timeframes to as short a time period as possible. Q: Will every provider sign these orders within the assigned timeframes? A: Probably not. But you will want to regularly monitor compliance with your organizational standard, and that probably includes provider report cards for CPOE compliance. Some organizations find that connecting these CPOE statistics to compensation helps improve compliance with organizational standards. Remember, it's all about safety and great patient care. Using the right order modes is essential to designing and implementing workflows that deliver that safe, great patient care. Once you have that good understanding of these modes, and the organizational policies to back them up, it becomes much easier to design clinical workflows that meet the needs of your patients, providers, nurses, pharmacists, and other ancillary staff. Hope this was a helpful summary! If you have any questions or feedback, please leave them in the comments section below! Remember, this post is for educational and discussion purposes only - Your mileage may vary. Do not use any of these standards or definitions without first consulting with your informatics team and legal counsel! Have your own tips for educating CPOE order modes, or anecdotes about how they improved your workflows? Feel free to leave them in the comments section below! Happy 2019! While I continue to work on compiling the business case for Clinical Informatics, I thought I'd take a minute to talk about #workflow terminology. Simply put - words matter. Any bilingual person who has ever tried to translate the phrase 'scram' or 'hit the road' into another language knows that a word-for-word translation does not always work. (Really? Hit the road..?) One might try to translate it as 'it's time to leave', but even that fails to convey the certain informal, vernacular quality that the phrase 'hit the road' conveys so well. So my advice to anyone working in a translational role - Do your best, but always translate at your own risk. Can a protocol be used to allow a Registered Nurse to titrate an IV heparin drip? Can a protocol be used to allow a Registered Nurse to give a pneumonia vaccination? Can a protocol be used to allow a Respiratory Therapist to titrate the settings on a ventilator in the ICU? Can a protocol be used to allow a Registered Dietitian to modify a diet for an inpatient? 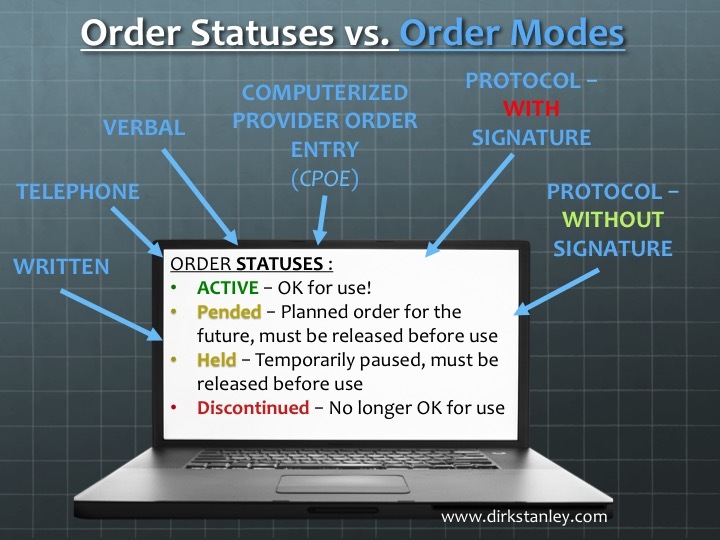 What is the difference between a protocol and a standing order? 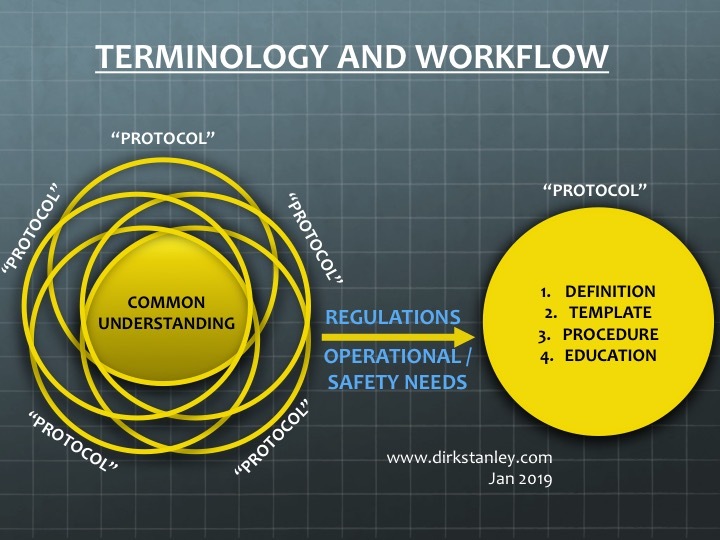 After all, once there is a clear definition - then you can create a standardized template, development procedure, and staff education to give everyone on your team a greater, more standardized understanding of the tool and what it can do. Remember - It all starts with the definition. Standing orders: Drugs and biologicals may be prepared and administered on the orders contained in pre-printed and electronic standing orders, order sets and protocols (collectively referred to as “standing orders” in our guidance) only if the standing orders meet the requirements of the medical records CoP. ... which may have slightly different understandings and definitions of these terms. Fortunately, there are some very talented medicolegal and compliance experts out there, who can help an organization to develop a strategy for navigating these regulations, while planning their workflows, both before and after an EMR implementation. One of the best I've seen is Sue Dill Calloway, BSN MSN JD, who has a fantastic series of lectures on the importance of this terminology, for regulatory, financial, and patient safety reasons. But in the absence of a simple, standardized national glossary, with good functional definitions of these tools - It can be very hard to develop the templates, development procedure, and education you need for your team. Guidelines and Policies initially look like they might have similar functions - until you consider that policies might result in root cause analysis and disciplinary action, and guidelines don't. (Policies=rules, guidelines=suggestions). 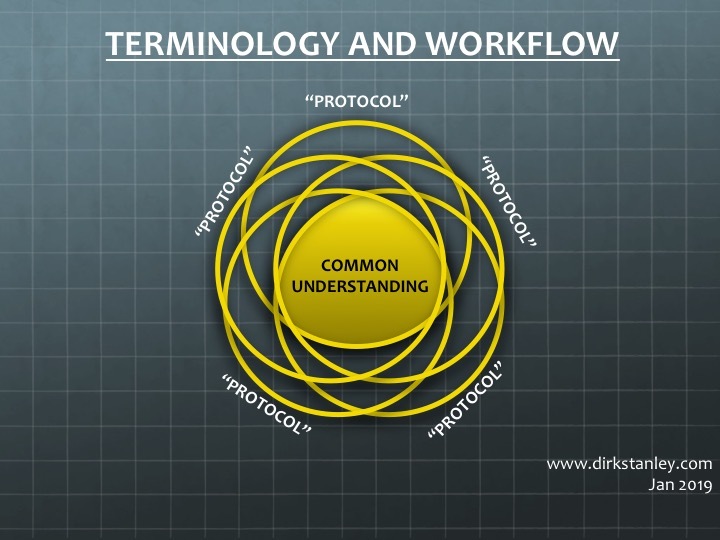 Protocols and Standing Orders seem to have very similar functional definitions, so we need to figure out if they are true synonyms, or if there is some kind of a difference between them. Procedures and Plans also have similar definitions - So we will need to figure out how to separate them. In this case, I've taken the liberty of separating them in time, suggesting that procedures describe current tasks, and plans describe future tasks. Standing Orders = Used for common, LOW-risk clinical scenarios in which the benefit to the patient of rapid evaluation and care outweighs any known risks. Standing orders may be initiated ('triggered') by a clinical POLICY (e.g. 'All clinic patients will be screened and potentially administered for pneumonia vaccination, according to the Standing Orders for Pneumonia Vaccination.) All orders and outcomes of standing orders will be attributed to the attending provider. 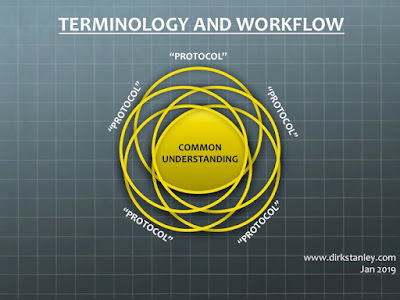 Protocols = Used for common, HIGH-risk clinical scenarios in which the benefit to the patient of improved care standardization outweighs any known risks. All protocols must be initiated ('triggered') or discontinued by an ORDER (e.g. 'Initiate Ventilator Liberation Protocol' or 'Discontinue Ventilator Liberation Protocol'). All orders and outcomes of clinical protocols will be attributed to the ordering provider. While you undergo this exercise, it's important to look at your regional, state, and federal regulations, and to speak to experts (like Sue Dill Calloway, BSN MSN JD as I mentioned above). 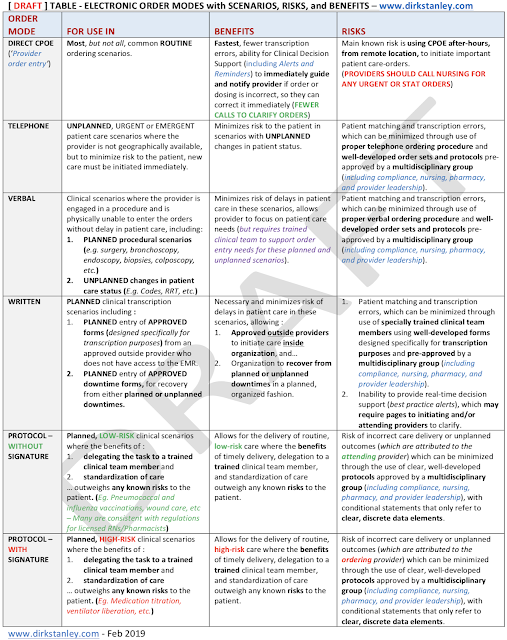 If there are no regulations to guide you in this grid, then you and your clinical and administrative leadership will have to make local decisions about how your organization wants to define these tools. As you work on these definitions, keep in mind other things you can do to improve safety and clarity, e.g. "Orders are documented instructions [ that ] must be signed within 24 hours." As you start to build out this grid for your own organization, talk to people who use these tools, and you'll start to better understand the form, function, and other issues related to their design. And once you think your grid is complete? Bring it back to your senior leadership for review, discussion, and formal approval. Voila! You now have your own organizational glossary that will help you develop the templates, procedures, and education that create a greater understanding, and improved standardization, predictability, and efficiency, for both your clinical and administrative teams. Hope this is helpful in guiding you to build your own workflow glossary! If you have any other tips, suggestions, or comments, leave them in the comments section below! Remember - This blog is for educational discussions only. Do not use any of these definitions without formal review and discussion with your own informatics, legal, administrative, and clinical teams. Have any other clinical terminology tips you'd like to share? Feel free to leave in the comments below!